People always see Ethiopia as a terrible famine starved country and yes while famine exists, Ethiopia is one of the most beautiful places I have ever been. The media doesn’t tell you about the beautiful scenery, they don’t tell you about the 100+ camels that will block your path when you’re trying to get somewhere; they fail to mention the beautiful rich culture of Ethiopia. Did you know Ethiopia has over 80 different languages, not to mention the different tribes? Each tribe wears different clothes, and most have different languages and their own unique culture. One of my first experiences with a tribe from rural Ethiopia, was when a group of us "faranji" (means foreigner in Amharic) descended from our bus to take a break from travelling. I was wearing a skirt to just below my knees and the women were trying to cover me up as I was showing too much skin. There was a little girl standing near her mother, I tried to shake hands with her and say hello, she screamed and ran behind her mother crying…she had never seen a white lady before. We stayed talking with them for about fifteen minutes, during this time they tried to teach us their local dance and language, but it was an epic fail on our part. Oh well, at least it gave them some laughs! Living in Dire Dawa for a summer was one of the most difficult and rewarding experiences of my life. The poverty is something you learn to see every day, and the Ethiopian way of life while it may not be our way is just something you have to get used to. Working with the street children living in Dire Dawa was incredible, they are possibly the most fun, loving and kind children I have ever met. One story that comes to my mind is the time my older sister and I got caught in a torrential rain storm at night. There was no shelter, and we had no umbrella. One of the children Roida who worked on the street at night (at the time she was maybe 10) came and gave us her little jumper so we wouldn’t be cold. We refused, as she had only rags for clothes and that was the only solid piece of clothes she had. At least we could get home to shelter once the rain died down…she couldn’t. A beautiful discription of life in Dire Dawa and the people. This blogs takes me back instantly to the place I refer to as my second home. 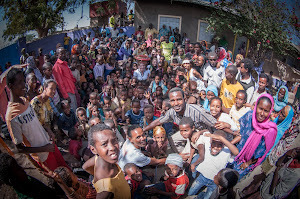 I feel very humbled to have had the opportunity to spend time in Ethiopia from a young age. I have been many places in the world with few having as much as an influence on my life. I am so grateful for the experience, for meeting beautiful people and sharing cultures. A very emotive blog that makes me want to be back there.